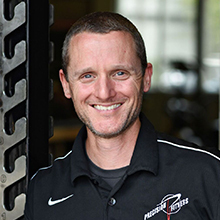 At Precision Fitness in Cornelius we pride ourselves on having the most qualified team of fitness, wellness, and sports medicine professionals throughout North Carolina. All of our fitness trainers are nationally certified and highly experienced in their unique field of expertise. Check out some of our testimonials online or contact us today to learn more about our facility, our professionals and our programs! ​In the summer of 2001 after spending years practicing in the specialty of Orthopedics and Sports Medicine, Bill founded Precision Fitness-Personal Fitness, Inc. As licensed Registered Nurse and National Strength and Conditioning Association – Certified Personal Trainer, Bill has dedicated his career to helping individuals identify and overcome obstacles that stand in the way of optimal wellness and peak physical performance. A strong advocate of life long learning Bill is an active member of organizations that include The National Strength and Conditioning Association, The American College of Sports Medicine, National Association of Orthopedic Nurses, USA Weightlifting and USA Triathlon and is certified as a USA Track and Field Level 1 Coach & USA Rugby Level 300 Coach. As a recognized expert in the field of corrective exercise and performance, Bill has contributed to numerous publications and industry websites and has co-authored three books on fitness and performance. 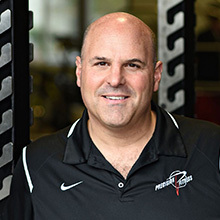 Since opening Precision Fitness, Bill has enjoyed helping clients that range from the elite athlete (NFL, PGA, NASCAR, MLB, PBA, including Daytona 500 champions, an INDYCAR Series Champion, a 2X Red Bull Global Rally Cross Champion, and members of the NFL and Professional Bowlers Association Hall of Fame) to the student athlete and from fortune 500 executives to stay at home moms. 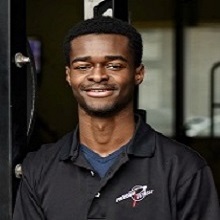 Verun first came to Precision Fitness as an intern from UNC –Charlotte. 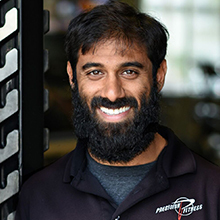 Upon graduating with a degree in Exercise Science and earning his certification a Health and Fitness Specialist through the American College of Sports Medicine, Verun became a full time member of the Precision Fitness team. Verun is and an excellent coach and motivator who's training approach has proven successful with all populations regardless of fitness or performance goal. 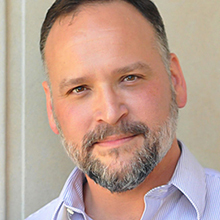 After receiving a Bachelor of Science in Health and Fitness from Springfield College in 1993 Dave spent seven years working at the prestigious Duke University Diet and Fitness Center. During his time in Durham, Dave helped coach world class athletes as a volunteer Strength and Conditioning Coach at UNC – Chapel Hill. 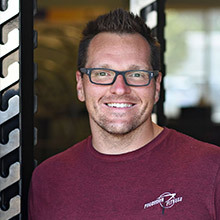 Prior to joining Precision Fitness, Dave served as the Personal Training Director for the Lake Norman YMCA. 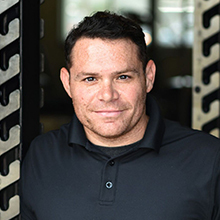 Dave has helped countless individuals meet a variety of fitness and wellness goals and has extensive experience coaching young athletes to a higher level of fitness and athletic performance. Dave is a Certified Strength and Conditioning Specialist through the National Strength and Conditioning Association. Bob Driver is a board certified Emergency Medicine physician who has been practicing medicine for over fifteen years. He is certified in Advanced Bioidentical Hormone Replacement Therapy and is also a member of the Age Management Medical Group. He received his Bachelor of Science in Business Administration from Duquesne University and his Doctor of Medicine from Drexel University College of Medicine. Bob is a founder of Spartan Medical Associates, that offers individualized bioidentical hormone replacement strategies and a concierge level of service that brings the expertise to you. Please visit www.spartanmedicalassociates.com if you would like to learn more about Bob. Kenny is a native of North Carolina that is a fitness and sports enthusiast that graduated from the University of North Carolina at Charlotte with a Bachelor's of Science degree in Exercise Science. While obtaining his degree, Kenny played for the Division 1-level baseball team at UNC-Charlotte, and worked to become a Certified Exercise Physiologist by the American College of Sports Medicine (ACSM). Kenny's passion in personal training is to provide clients with a higher quality of life, and greater understanding of holistic fitness. Pierre is a BOC certified athletic trainer with a certification from the National Academy of Sports Medicine as a Performance Enhancement Specialist. He is also certified as a Graston Technique practitioner. Pierre graduated from UNC Charlotte with a bachelors degree in athletic training. As an athletic trainer, Pierre has worked with a variety of athletes from high school and collegiate athletes to amateur and professional Mix Martial Arts athletes. Alex is a Certified Strength & Conditioning Specialist as well as a Licensed Massage & Bodywork Therapist. 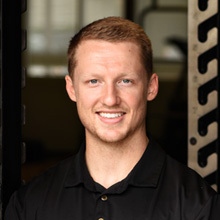 Prior to joining Precision Fitness, Alex has worked as a strength and conditioning professional for such top organizations as The New York Knicks and the New York Mets, Fairfield University and Villanova University, and has had the privilege to work with athletes in MLB, NBA, NHL, NFL and NASCAR. Alex has a long and varied athletic background. After competing as a NCAA Division I athlete he went on to a career as a Strongman qualifying for the North American Championships on multiple occasions. Over the last few years Alex has become passionate about the sport of Triathlon. In 2016 Alex earned the title of NATIONAL CHAMPION in Clydesdale Division and became certified as USA Triathlon coach. Alex brings a wealth of knowledge and experience that allows him to take his clients health, fitness, and performance to the next level. 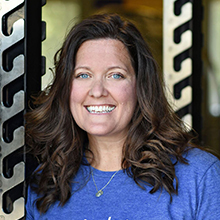 ​After graduating from East Carolina University in 1995 with a degree in Health and Human Performance, Randi started her career at the Duke University Diet and Fitness Center helping people incorporate fitness into their daily life. 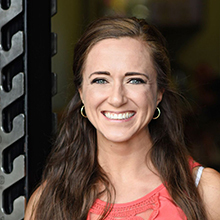 After relocating to Charlotte, she worked as the Wellness Coordinator at a local YMCA for 10 years where she conducted wellness seminars, personal training, and taught a variety of aerobic classes. Randi is certified through the NASM, NETA and is also certified to teach CPR, AED, and first aid through the American Red Cross. During her free time she likes to spend time with her family and travel. She is also a huge Boston/New England sports fan! Jessica began her studies at SUNY Cortland, earning a Bachelor’s degree in Science, more specifically Community Health with a Concentration in Wellness and Promotion. With a strong interest in health and wellness, Jessica has developed a daily routine around a wellness lifestyle. By adopting a healthy lifestyle, Jessica discovered her true passion for holistic healing and decided to earn a license in Massage Therapy. As a graduate from the Finger Lakes School of Massage with 1000 hours of study in Therapeutic Massage and Hydrotherapy, Jessica has earned her license in Massage Therapy in NY and NC. She also has trainings in Core Stone Massage, Advanced Physiology in Pain, Knee Pain, and is a professional member of the American Massage Therapy Association. Prince Jean is an internationally licensed Massage Therapist earning his license from the Training Institute for Kinesiotherapy and Massage located in Marseille, France. Prince has been practicing massage for 5 years and earned his US license from the Institute for Therapeutic Massage. Prince has been a Personal Trainer for about 3 years; certified through the World Instructor Training Schools, and is currently in pursuit of a certification from the National Academy of Sports Medicine (NASM). As a Massage Therapist, he believes that despite its' effectiveness, soft tissue work alone is not enough to eliminate pain, dysfunction, or imbalances in the body. Functional movement and exercise training must be included. Being dual licensed allows him to provide our clients with the knowledge and practice to free themselves from such conditions.